I had decided weeks ago that I was doing this. I had been to a number of book events at Changing Hands, my favorite independent bookstore, so this wouldn’t be any different. Except that the book pusher was a cat. And not just any cat… but Tardar Sauce, or as most know her, Grumpy Cat. Now, I am not a cat person. My first introduction to cats as pets was when my mom had a black and white named Josephine who could be sweet as honey and then all of a sudden attack you. Attack you! While you were petting her. It was appalling and absurd and as I began to learn… common cat behavior. Uhm, no thank you very much. Then my dad and stepmom went from being dog people to cat people (a transition I still can’t completely understand except they are travelers and I guess cats make that easier). Their black and white boy Bandit, may he rest in peace, was an adventurer, friendly and even a snuggler. Smokey on the other hand lives like she’s in hiding, but is sweet when she does grace you with her presence. And if you are keeping up, yes, my parents at one time had two cats named Smokey and (the) Bandit. And then sometime last year came this goofy little cat, Tardar Sauce. A permanent frown on her face, she became known all over the interwebs (and surely the world) as Grumpy Cat. Soon her own website, hundreds of Internet memes, t-shirts and buttons and mugs and stickers made in her likeness, a trip to the Today Show, and a cultural phenomenon was born. All because some dude took a picture of his sister’s cat and uploaded it to the web. And now, another Internet millionaire has been hatched. Yes, I was a bit smitten with this kitten. I became a fan of the Official Grumpy Cat facebook page, sharing many of her images with my own facebook friends. I learned that Grumpy Cat was local. I wanted to meet her. I wanted to see this cat in person, err, real life. I found out that she’s owned by the cousin-of-a-neighbor-of-a-barista-of-a-friend-of-a-friend who works with my BFF. THAT was going to be my in. But the BFF proved worthless in this situation, not understanding Grumpy Cat’s epicness or caring about my minor, but growing, obsession. Whatever. It’s fitting, and maybe even ironic (in the fake way of irony that Alanis Morrissette sang of back in 1995), that a book would bring me to my kitty crush. A couple of weeks ago, Changing Hands Bookstore announced Grumpy Cat: A Grumpy Book. Now, there wouldn’t be a reading (cats don’t read you know and I guess they don’t write either, but with a little hope, a prayer and something viral, they can put a book together and make you a zillionaire), but there would be a photo opportunity. What? A chance to come face to face with Grumpy Cat? I was all in! I posted my intention on Facebook, when in a matter of minutes my Snotty Literati cohort Jennifer Spiegel chimed in that she wanted to go and could we make a play-date-field-trip out of it with our kids? I didn’t care who came. I was going no matter what. Despite my excitement, I kind of forgot to order my book, which is what secures the ticket and photo op with Grumpy Cat. Whoopsie! So, on Friday I called to order my book. I am told that I will be in photo group Q. I’m in Q of the photo queue. Are you kidding me? When I came to see author Ann Patchett, I think the queue went to E and she actually WROTE her book. I began to think this was way bigger than I could imagine or handle. For the record, Jennifer jumped on it and got into group I. 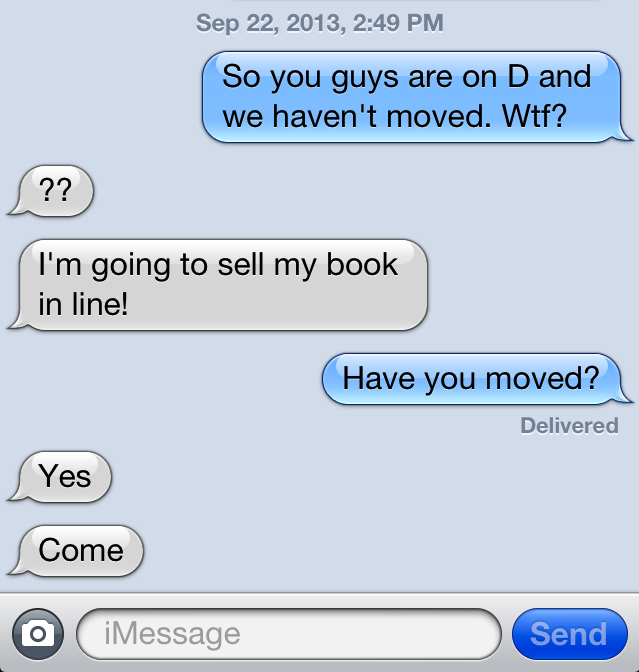 This left me seething and jealous and figuring out how on earth I could join her earlier in the line. We met up at Wildflower Bread Company for lunch, located conveniently next door with an actual pass-through to Changing Hands. It was a madhouse. We stuffed our kids and ourselves with cheesy sandwiches made of overly crusty bread and made our way into the maddening crowd. Did I say it was a madhouse? They had customers lining up, and spaced every twenty people or so, there was someone holding a pole with a letter affixed to the top. They were like pole bearers to the opening ceremonies of the craziest crowd-gathering events of all time. Jennifer and her girls settled into the Fiction section which held the ‘I’ pole bearer while the kiddo and I wove our way outside to Q, next to a wheeled cart of books for sale. Camera men from a local news station and an alternative paper were snapping up the spectacle. I actually started to purposefully look away from the camera. A man dressed in a Grumpy Cat costume handed out stickers reminiscent of the Obama HOPE campaign posters, with a prominent NOPE beneath Tardar Sauce’s famously frowning face. We learned later that this man was either Grumpy Cat’s uncle or cousin and for some reason this made it a little better. There was no explanation for the girl dressed as an unknown female super hero, except she’s probably one of those women that will use anything as an excuse to put on a leotard. That was all I needed to move. In that short of a time, they were now at F or G. Grumpy Cat wasn’t wasting any time. We strategized how we could just get both of the pictures done now and not have to go back into the line, outside, next to the wheeled carts of sale books. We had moved close enough that we could see sweet Tardar Sauce laying in her little kitty bed. It turns out there was to be NO TOUCHING of the kitty and you just got to squat/kneel near her while one of the bookstore clerks snapped your picture. Grumpy cat’s minor-child-looking owner stood behind the bed looking calm as she was counting up the $12.95 per 14,000 people was making her. We wove past Fiction and were in between the stacks of U.S. Military History which meant my son asked if I would buy him every single book he touched. I needed this to wrap up. I needed to see Grumpy Cat and I needed to leave. There was no way I was going back to section Q. No. Way. We turned the corner and I pleasantly noticed that the ticket taker/checker chick wasn’t there. We were moving forward. A simple bathroom break may have been my chance to cheat the system loophole. I turned to Jennifer to share the good news only to see that ticket taker/checker chick was, in fact there, asking for my ticket. I turned to her and turned on the charm, or was it desperation?, and explained our situation. I pimped out my kid saying there’s no way he could wait through this, could we just please just do both the pictures now, please? And oh yes, we understand that and next time yes we will plan better and thank you goodness you are an angel, kids, go… GO. GET BY THE CAT, SMILE! MOVE OUT OF THE WAY IT’S OUR TURN. MOVE! MOVE, REALLY. Oh, now it’s our turns to smile? Okay here we go. Look how cute she is! Is she asleep? Oh, okay we are smiling. Yes, we got it. Okay we are leaving. Yes we are moving we are moving right along and we are out of here. Okay. Okay. We are out of here. And it was over. Just like that. I am sure I let out a deep breath. You’d have to after all of that. Then I think we just looked at each other amazed and dumbfounded and thankful to be done. Thankful to have done it, yes. But a little sad knowing that a cat can garner a bigger turnout than a writer and that we were a part of it. 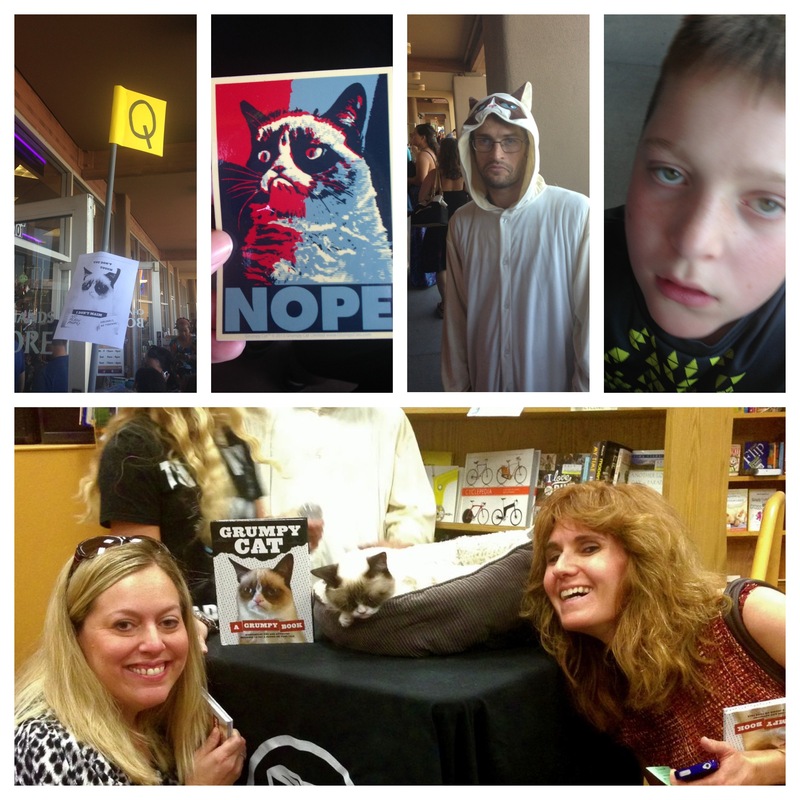 Section Q, Grumpy Art, Grumpy Cat-man, Kiddo Barely Hanging On, The finish line, with Tardar Sauce, who slept through our photo op. Cute story. Is Tarder Sauce a stuffed animal by chance? P.S. You are the only person Josephine ever “attacked.” Hmm. Maybe that’s why I’m not really a cat person… I like them, but they don’t like me?